And I decided to follow because I really stay at home for these few weeks already without going anywhere... I wanna hang out even though I don't have any common topic with dear's friends... But I will behave nicely de... trust me! Their appointment set at 430pm. I start prepare at 250pm. Dear say I'm not going to finish on time and reach there on time... I won't let dear late de! So I finish take bath, make up, change clothes and everything within 40mins! Geng leh? Hehe..
We reach Midvalley around 440pm. Late for 10mins... But dear's friend were more late than us! LOL! Chun Munn arrive around 5pm... Alien arrives at 530pm... LOL! It was such a fun thing to hang out with dear's friends since they all are very good in joking and talking craps. And we end up having our lunch+dinner at Nandos!! My First Time!! 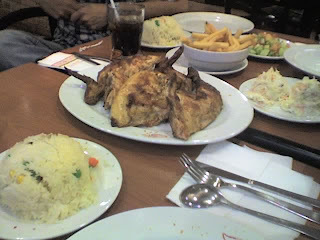 Even though the price was slightly higher than Kenny Rogers, but the chicken was fresh and all the side dishes were YUMMY!!! Highly RECOMMENDED!!!! Go try yourself!